An arch is two weaknesses which together make a strength, Leonardo suggested when talking about buildings, but I think we can apply it to an idea of friendship. When you look at an arch – the forces that compress need to hold together in a state of equilibrium. Great and sustainable friendships are like the arch. You will probably find that when one puts more weight in than the other does, that either one or the other or both, will collapse. Sure, it is an ideal but we need not have to relinquish parts of ourselves to be in relationship with another, and we need not have to give more than the other is prepared to give. Equal weight, balance, and negotiating the spaces between until that is achieved. That in between space where the two weaknesses come together, where the compressive forces meet, the ‘third space’ (what theorists nominate as intersubjectivity), is actually a place where we find nurture and where we can birth and nurture something ‘other’ - be it our 'self' or a work of art. Often it is the place where love grows. I tried to capture this experience in a simple drawing some time ago – visually it captures an impression of what I mean. I bring up the idea of friendship or relationship as an arch, as a justification for my penchant for working collaboratively. In collaboration, I either find or remember an aspect of myself or find a possibility for re-invention. This is the way I have experienced that most primal of relationships - with my mother, who is my best friend. She has always been a fabulous storyteller and our engagement through conversations now that her best friends have passed, have allowed her to continue with her story telling. I've even been compelled to write down these stories before they pass with her. In between, in the ‘third space’ is the expressive woman, which we both share. What came to be called the ‘Friendship Scarf’ happened accidentally. Fabienne Dorsman- Rey had sent me a few eco-dyed samples after I’d packed her an envelop full of eucalyptus leaves found in Sherbrooke Forest close to where I live - what you can call my ‘backyard’. The bits from Fabienne weren’t enough to make a piece but I was so touched by their unique beauty that I wanted to make use of these ‘samples’. So I started to sew them together along with other bits and pieces that I had – sari remnants from Glitz and Pieces on Etsy, other silk and cotton scraps until I had enough ‘carrier fabric’ for a nuno felt scarf. I wanted to work in a way that left the beauty of the eco-dyed fabrics and sari remnants exposed as much as possible. While I was ‘playing’ with this scarf, touched by the friendships that have bestowed all bits upon me, I was also making a few scarfs to enter in the annual Melbourne Scarf Festival. I had never intended that the mosaic scarf would be entered in the event. When Philip looked at the ‘results’ he thought the mosaic scarf was the best of the lot and that it needed to be part of my contribution to the festival. ‘But I don’t want to part with it,’ I told him. If I did part with it, it would go to Fabienne. Then I thought if I priced it highly enough no one would buy it – even though priced, as it was, it was still a bargain given the hours of labour in the scarf and its psychological significance. The theme of the festival was ‘the rhythm of my day’, and serendipitously it fitted easily with Facebook being a part of my day, and where I’d encountered my friends and been enriched both creatively, and personally. 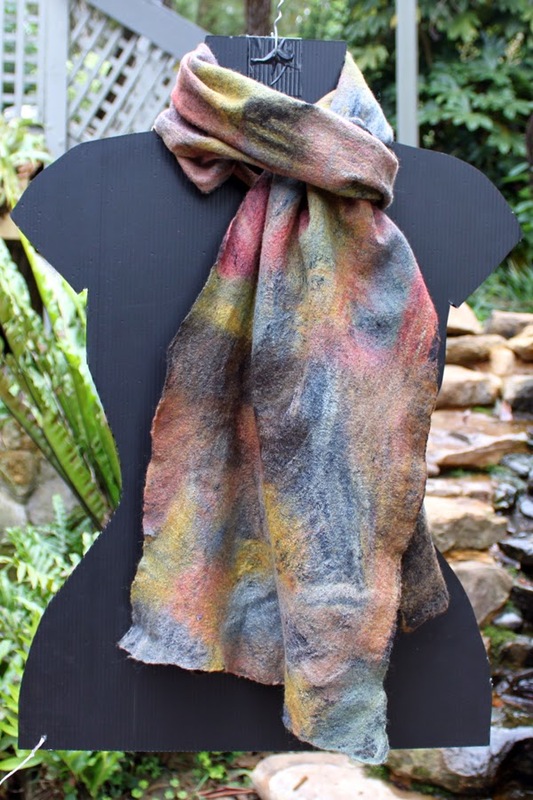 I considered the scarf as a co-creation, in which not only bits and pieces from others came together to make one work, but as well, those bits enabled me to approach felting in a different way to what I would have normally. For me it inspired love - love of the materials, the process, and the people involved. The scarf was subsequently bought by a woman who fell in love with it. Joni your work is devine!! Thanks Carolyn means a lot coming from such a wonderful felt maker, as you. Oh, Joni, our lives are so enriched by your friendship, your words and your art. You are a gift. Your mom must be so proud of you, her daughter, for all of the gifts that you possess, many passed down from her...and the greatest of those, the shared bond of your story telling. That you've been able to use that in your art is truly beautiful. Your words and your art always touch my heart. Hope that the person who bought your scarf knows what a treasure she possesses. Did she know the story behind it? I did have that brief description and I was limited by how much I could describe Dawn. She did tell me that she could see how much time and love went into its making.